DICE's Star Wars extravaganza continues to grow. Star Wars Battlefront arrived last year without much in the way of decent single-player options. The wave-based missions took place in smaller, less-than-exciting maps, and though they were an okay distraction from the online modes, it was slightly disappointing from a series that had offline modes for everything back in the rougher days of Pandemic’s efforts. Even The Force Awakens actor and Star Wars games enthusiast John Boyega asked EA about the lack of a story mode on Twitter, which hopefully means DICE will add one to the 2017 sequel just out of sheer politeness. 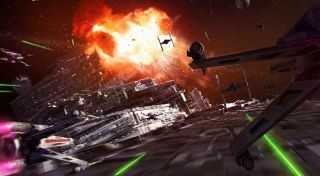 Cut forward eight months, then, and DICE is finally adding a stronger offline option to Fighter Squadron and Walker Assault this week, two of the biggest modes in the game, and where most of the spectacle of Battlefront is concentrated. In case you’ve not played Battlefront before, Fighter Squadron is the game’s spaceship-only dogfighting mode, while Walker Assault is the busiest and most cinematic Battlefront has to offer, putting players in battles that don’t skimp on the AT-ATs. Skirmish mode lets you play both with bots of varying difficulty. I sampled both at Star Wars Celebration in London this past weekend, though they only had a PS4 build on the stand. For the more skilled online players still enjoying Battlefront, this possibly prompts cries of ‘noobs’ and the like. Thing is, though, if you want to get a quick shot of Star Wars spectacle or sightseeing in Battlefront, there isn’t currently a good option in which to do that—everyone’s fighting to get the Falcon in Fighter Squadron. This lets you have all of those moments with an optional challenge on top. I tried Hoth’s Walker Assault map on the lowest difficulty, Normal, and it was probably too easy for me. I bagged 50 kills, and died three times, twice because I flew my A-Wing into AT-ATs, which I’d be lying if I said didn’t happen a lot. This is a beginner-level setting, probably for those who really struggle online (I know my dad will like it), but it’s nice to have the option of just mowing down stormtroopers if you can’t be bothered with any competition. Much better was trying Fighter Squadron on Master, the highest difficulty setting. The crossfire is intense, and while fighters will still occasionally drift in a straight line so you can easily pick them off in a way that human players rarely would, they’re a lot more switched on than the bots are during online mode. You have to hammer those evasive maneuvers a lot. I ended up with a similar 2:1ish kill/death ratio that I’d normally get online, and felt suitably challenged, even if my opponents’ behaviour still felt more scripted than human players. As I said, it was nice to jump in the Falcon’s cockpit with no competition. On Master mode, though, since I spent about half the game in X-Wings and A-Wings while the opponent activated Slave I from the start, I found myself at a point disadvantage I was only likely to overcome by piloting the more powerful Falcon straight away. In any case, since we know we’re just over a year away from a sequel to Battlefront, I actually think this is a pretty decent addition as a free update to all players. Skirmish allows you to condense about five online matches’ worth of spectacle into one offline game, which given how broad Star Wars’ audience is, I think is likely to be a welcome option to a decent chunk of people. Skirmish allows you to condense about five online matches’ worth of spectacle into one offline game. I ask if this indicates the first step towards more substantial single-player options in 2017’s Battlefront 2. “Well, we don't have anything on the next Battlefront to share—we're mostly just talking about Skirmish mode,” says Fegraeus. “Obviously, though, with everything you do, there are learnings. We've done a lot of stuff with Skirmish mode, with expansion packs, and a bunch of other things, and all of the stuff we've learned there we'll of course bring with us going into the next one.” Battlefield doesn’t have a reputation for amazing single-player options of late, but a story-driven campaign makes sense in a universe like Star Wars. Collaborating on Battlefront 2 is the relatively new EA studio Motive, who EA say is ‘making great progress in building out a significant new addition to the game’—that sounds to me like a proper story mode. For the rest of the year, Battlefront has two pieces of DLC, which were detailed (a bit) this past weekend at Star Wars Celebration: the Death Star and a Rogue One expansion, featuring Scarif, the tropical planet from the poster where the stormtroopers look like they’re having a lads-on-tour paddling holiday. I don’t love season passes, admittedly—though I appreciate the occasional free map DICE has given away for Battlefront—but I must admit the Death Star is a big enough draw that I’d consider buying that one by itself. While Battlefront launched light on content for a £50/$60 game, as Andy said in his review, Skirmish mode seems like a solid addition. There are now options to suit people who just want to play as a Star Wars tourist, to take in the gorgeous maps and iconography without too much of a challenge—that’s not bad for a freebie. It also means there’ll always be some way to play Battlefront’s better modes, too, long after the servers are abandoned by players when the new one comes out.